AMERICAN’s Waterous Series 600 swing check valves are in full compliance with ANSI/AWWA C508. Configurations are available that are UL Listed. Rated working pressure is 200 psig. These check valves are suitable for horizontal or vertical installation when the flow of water is in an upward direction. 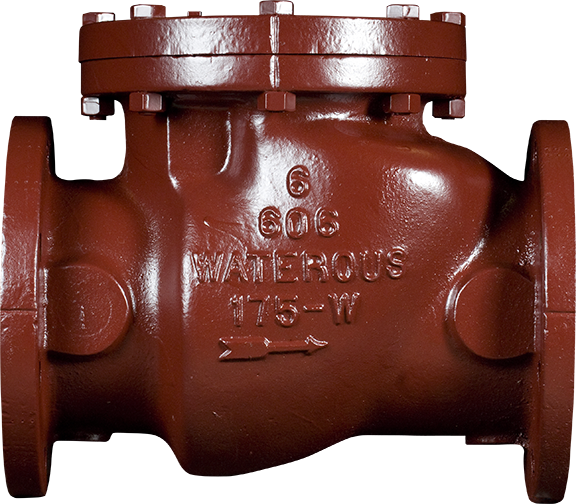 Waterous Series 600 swing check valves feature sturdy iron body and bronze mounted construction. This design provides extensive use of corrosion-resistant materials in places where corrosion may be a problem. The disc is constructed of high-strength bronze with a rubber seal recessed into the disc to assure a positive seal even under low pressure. Series 600 swing check valves are available in sizes 3" through 12" and are available with lever and spring or lever and weight for applications where rapid flow reversals may be encountered. The clapper arm is made of high-strength bronze. The check valve disc and clapper arm assembly use corrosion-resistant bearings, bushings and washers to reduce wear and assure long operating life. These check valves are designed to provide a “Full Waterway” per MSS SP-71, Type I. Swing check valves with Full Waterway, when fully open, have waterway cross-sectional area at any point that is at least equal to the area of a circle whose diameter is the nominal valve size. Series 600 valves are available with the interior and exterior of the valve coated with fusion-bonded epoxy in accordance with ANSI/AWWA C550.